I love stuffed zucchini and usually make it a few times during the summer season. Here in Florida we get several harvests of zucchini including these grown by the Barefoot Farmer. When making this dish choose specimens that are s straight as possible which makes it easier to fit then into trays. These are not vegetarian as they contain bacon, however it can easily be adapted for use without bacon…and it’s just as good, seriously….I am not kidding! In a large steamer add zucchini steam until a knife easily pierces flesh, but be forewarned, if you let them steam to much they will be very difficult to work with, roughly 15-18 minutes of steam time. Remove and add to ice water bath, after a few minute slice them in half and use a spoon to remove the insides while preserving the structure….be careful….DO NOT BREAK THE RIM. In a large skillet of medium, high heat add bacon, fry stirring often until lit starts to brown and get crisp. Add the rest of the vegetables (except zucchini) and cook for 15 minutes or until all veg gets some nice action in the pan…a bit brown but not dark. Add 3 tbs parmesan cheese and zucchini, cook another 10 minutes until the contents of the pan are not runny….should be rather firm. Be careful not to burn the stuffing, needs to be without too much liquid, but not burned!!!!!! 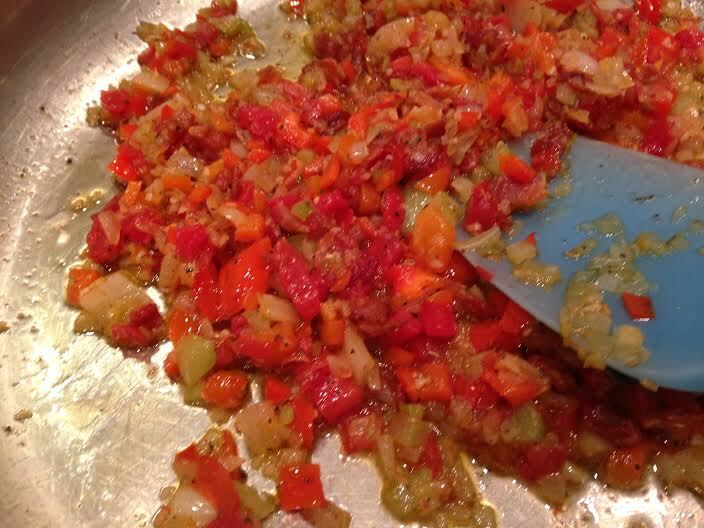 Greases a sheet tray, lasagna pan or similar, add empty zucchini. Pat them dry inside then season with salt and pepper. Stuff with stuffing, top with remaining cheese, back at 350 for 45 minutes or until starting to brown.